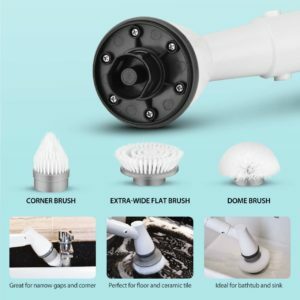 Homitt Electric Spin Scrubber Power Brush, Cordless Shower Scrubber with 3 Replaceable Bathroom Scrubber Cleaning Brush Heads, 1 Extension Arm and Adapter for Tub, Tile, Floor, Wall and Kitchen is now available at Amazon.com for just $44.99 (REG $79.99) (As of 07 February 2019, 19:43 PST – Details) with $35.00 (44%) Savings. PORTABLE CORDLESS DESIGN: Powered by built-in rechargeable 3.65V 2150Mah battery, the cordless spin scrubber can last continuously up to 60 minutes after only 3.5 hours fast charging. The 360 degree high rotate speed meets your need of long working duration to clean and wipe the dirt thoroughly without interruption. 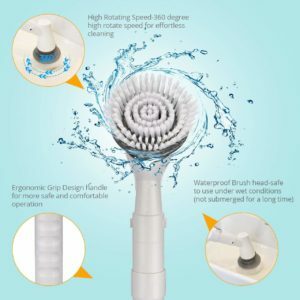 3 REPLACEABLE BRUSH HEADS: 3 brush heads included to fulfill your different cleaning inquiry for shower, tub, tile, floor, bathroom, grout, kitchen, baseboard, sink, wall, toilet, ceiling, window and so on. 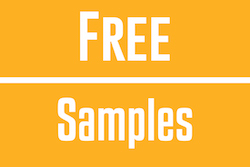 The Interchangeable Brushes for multi-purpose uses to get rid of soap scum, mildew, grime. Flexible and durable bristles can get into cracks and crevices with supreme effectiveness! 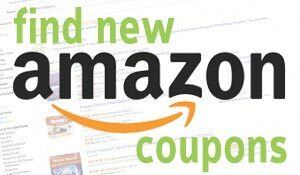 Search Homitt brush heads can be bought extra replaceable brush heads. 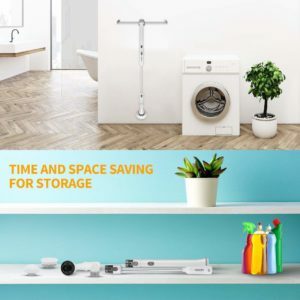 CUT CLEANING TIME: High-torque bathroom scrubber power up to 280RPM and built-in 2150Mah Li-ion Battery enable you to scrub any dirt in your house. 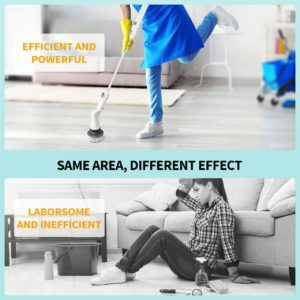 Strong power helps to clean dirty faster and easier than manual cleaning. Say goodbye to stubborn stain and cut the scrubbing time to a quarter of the time. However, the volume within 70db for idling, but can be controlled within 80db when you do the cleaning. 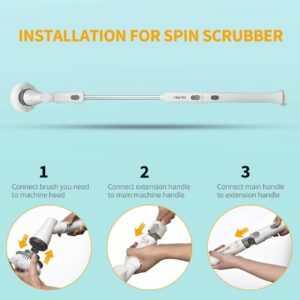 BACK AND KNEES SAVER: Different from other electric spin scrubber, Homitt power brush come with an extension arm and adjustable brushes handle can adjust to be tilted or versatile when pressing the button. 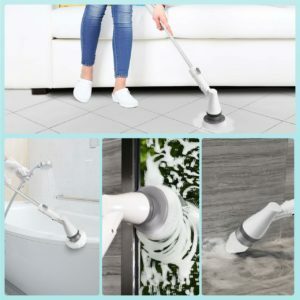 It also comes with the 18.5-inch extendable handle for you to scrub and clean hard to reach corners without bending and/or kneeling to do cleaning anymore, especially healthy for knees and back pain and arthritis. 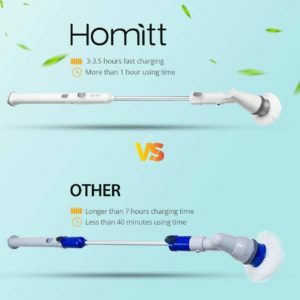 BEST GIFTS FOR FAMILY AND FRIENDS: Homitt shower scrubber without bending and huring back, knees and arms, makes cleaning job faster and much better. 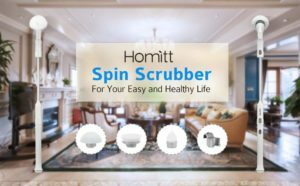 Best gift for your mom, wife, grandma, grandpa, friends, husband and yourself, start to exercise your husband do cleaning job with Homitt power spin scrubber. 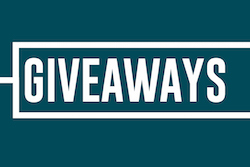 Please be advised that Homitt has 12 Months Warranty and 60 Days Money Back Guarantee.